Our wedding planning blog. 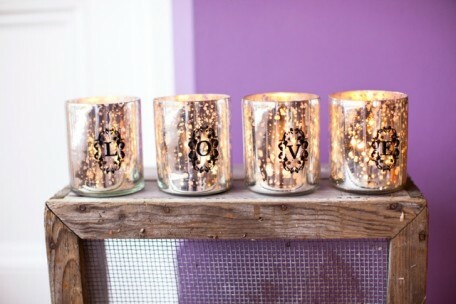 Keep up to date as we blog our latest finds, ideas and inspiration from the amazing and beautiful world of weddings. 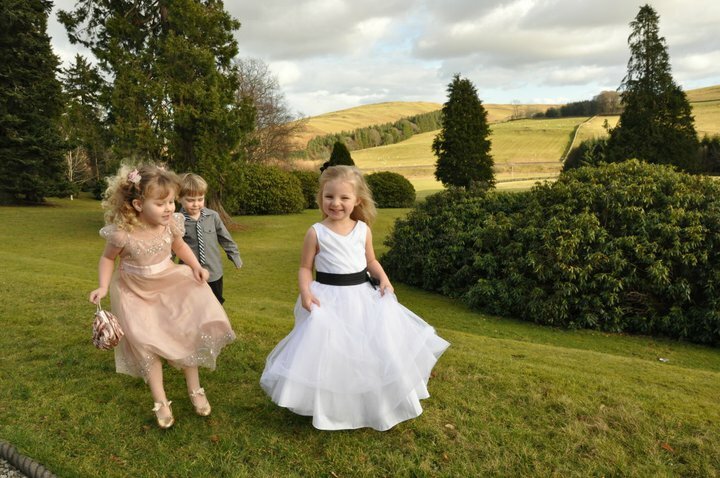 Sheila Scott has been taking wedding photographs in the Scottish Borders and north of England for more than 20 years, but she’s no plans to rest on her laurels! 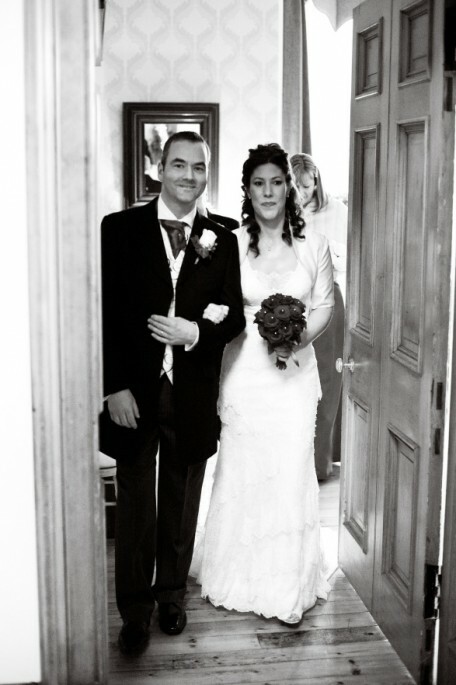 Part of an award-winning team with her husband Harry, she specialises in bringing out the best in each couple’s personality and passions, and seizing the moment on the day. Whether it’s wind-strewn leaves, a sleepy bridesmaid or a shower of rain, Sheila beautifully captures the small decisive moments that make every wedding different. ‘I started photography as a hobby when my daughter was born,’ she says, ‘then opened a studio business in portraiture, and branched into wedding photography over 20 years ago. My photography experience has included everything from industrial and commercial assignments, to the Queen, TV personalities and government ministers. Some of my more unusual commissions have involved coffins, sewage works and septic tanks, but I can also be seen wearing a yellow reflective jacket, hard hat and safety boots, up ladders, on building projects or photographing road works in progress’. 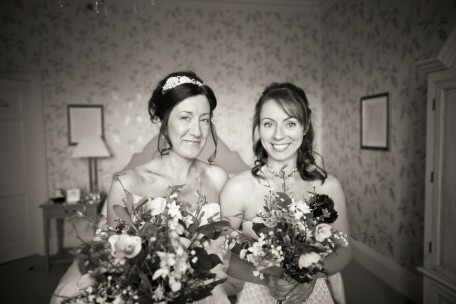 Sheila’s work has been widely published in magazines, and she’s photographed brides from all over the world. ‘Now, I choose to concentrate mainly on wedding photography, as Harry and I both enjoy it, and we feel it’s a privilege to be involved in such a special day’. 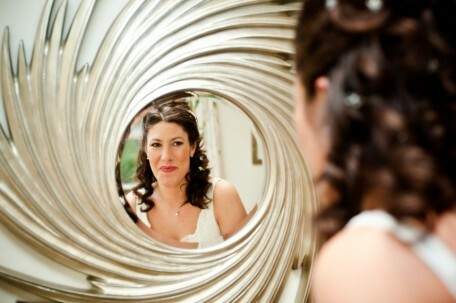 A self-confessed gadget and technology lover, Sheila moved into digital photography in 2000. 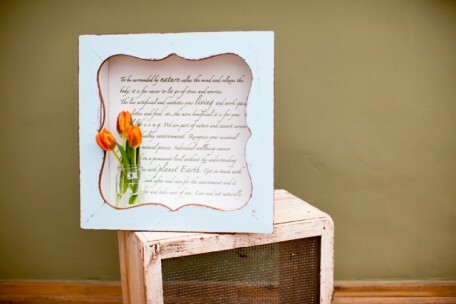 ‘I took the plunge earlier than most professional photographers, and I’m constantly updating my products to include the latest in digital offerings for the bride and groom, introducing an iPad package in 2010. My most recent venture is a professional wedding photo booth, which is the latest must-have for wedding receptions’, she says. Email Sheila Scott or visit her website: Sheila Scott Photography. 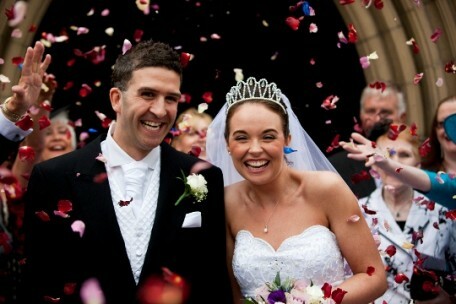 Lindsey Hunter of Get Knotted is a wedding planner for Scotland and the north of England. She’s the in-house wedding planner for four lovely Scottish wedding venues: Mellerstain House, Aikwood Tower, Hoscote Estate, and the Buccleuch Arms Hotel. For more wedding inspiration, visit our gallery. 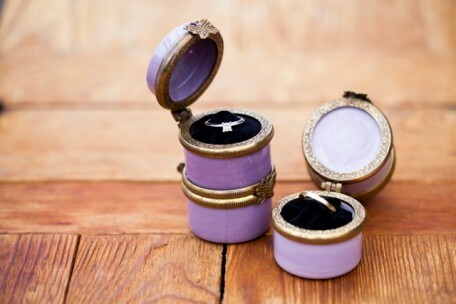 I’m a great fan of vintage wedding style and pretty objects that make good wedding gifts, so it was great to come across the Very Fabulous online boutique. 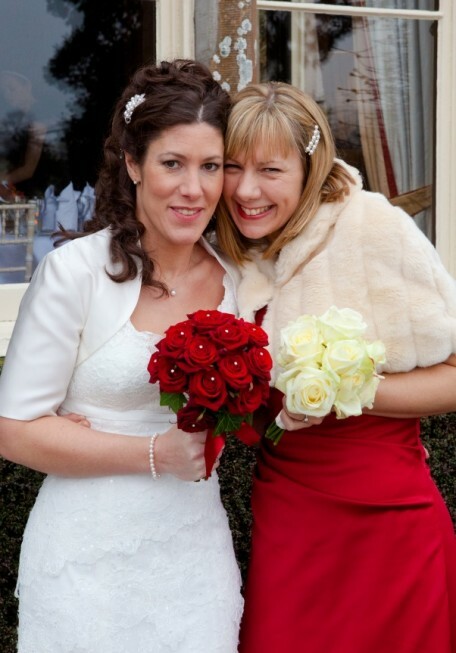 It’s run by award-winning wedding stylists Cindy Kirkland and Kim Neville, whose motto is ‘there’s always a place for something fabulous in one’s life’. Couldn’t agree more! 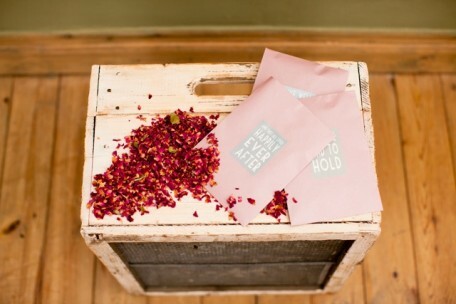 The creative duo have more than 15 years’ combined experience in styling beautiful events, and have just launched an online mail order service selling all their most gorgeous finds, including wedding gifts and treats for mothers and bridesmaids. Everything has been chosen to be used and treasured long after the day itself. 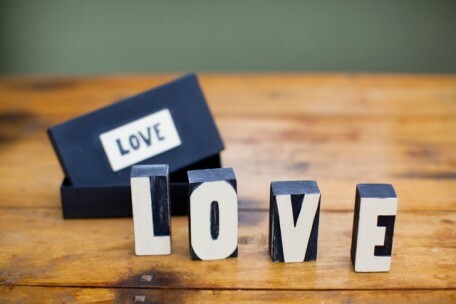 Unusual finds in their online range include a handcrafted memory board to display trinkets and souvenirs, wooden love blocks and beautiful love votives. Cindy and Kim have spent the past year scouring for undiscovered treasures in the UK and internationally, and there’s plenty of temptation on their site, even if you’re not planning a wedding – so be warned! Visit the Very Fabulous website (edit: currently site not available – June 2012), or click for more vintage wedding ideas from Get Knotted. 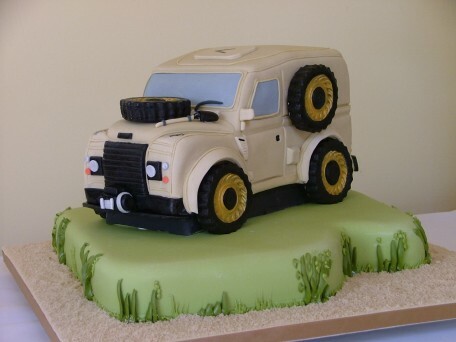 Royal Wedding watchers can’t have failed to notice a tasty trend that’ll appeal to everyone that’s no so keen on traditional wedding cakes – the groom’s cake. Prince William apparently requested his favourite chocolate, biscuity one using McVitie’s Rich Teas, as an alternative to the magnificent eight-tiered one created by Fiona Cairns. It seems grooms’ cakes aren’t a new phenomenon – there’s a recipe for a ‘Plain Bridegroom’s Cake’ in an 1897 book called The British Baker. In the meantime, the trend originated in the United States, and the Royal Wedding has given it a big boost over here, with cake designers reporting a sudden upsurge in enquiries. 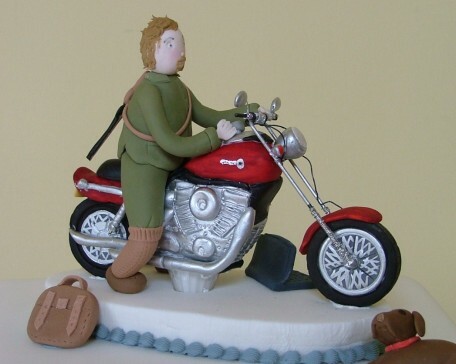 Groom’s cakes are usually themed around the groom’s job or hobby. There are some wild and wonderful examples on Flickr, featuring beer cans, Daleks, stags and even hog roasts. Time to have fun and let your imagination run riot! 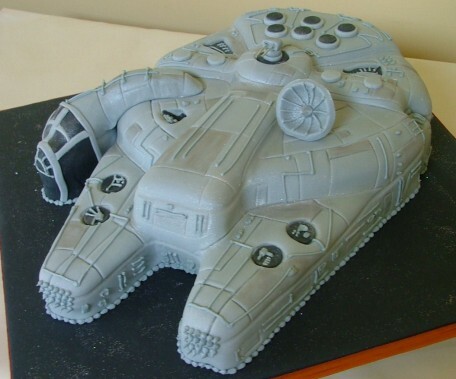 And the best part is, you can have a traditional bridal cake, and a fun groom version. 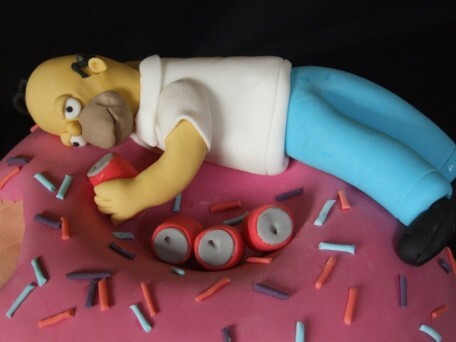 Have your cake and eat it, in other words. Sorry – couldn’t resist! Check out the fabulous examples from The Cake Partnership below, or click for more wedding cake inspiration and fun ideas from Get Knotted. 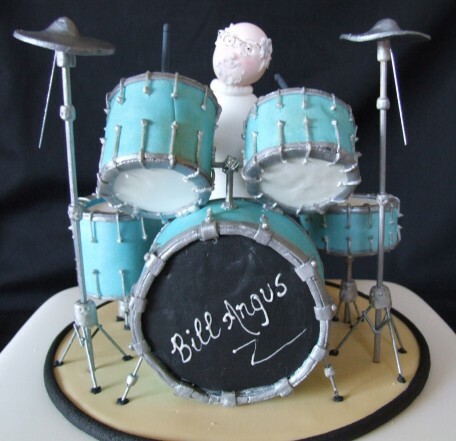 Visit The Cake Partnership for more delicious groom’s cake ideas! Scottish Borders Registrars say it’s business as usual, while changes continue to improve local registration services. Lisa Lauder, the Council’s Chief Registrar, says it’s all part of a review which will consolidate all the local offices. Lisa says it’s important to contact Registrar Services as soon as you know you’re getting married, whether you’re going for a religious or civil ceremony. 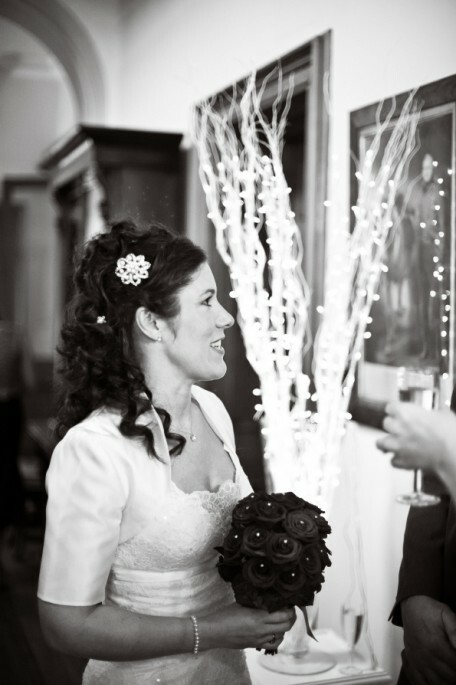 Lisa says registrars can also help couples to personalise their ceremony. ‘You can make it much more meaningful to you and your family by including readings, poems, special music and special words that can make all the difference. 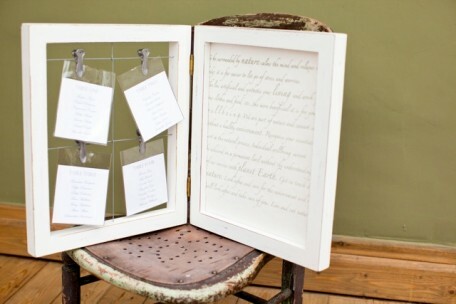 There are obviously some words which must be said in order to keep on the right side of the law, but there are plenty of ways to for you make your ceremony really personal’. There’s more information, including a checklist of what to do, on the Scottish Borders Council website at www.scotborders.gov.uk/registrars. Hoscote House near Hawick gave a sunny spring welcome to Alison and Paul for their houseparty weekend wedding in early April. 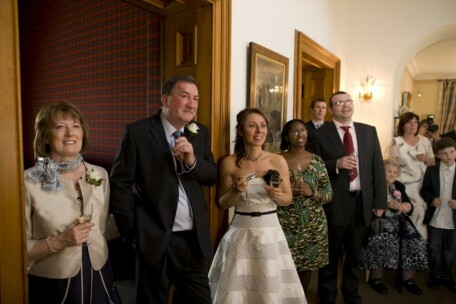 Alison’s family originate from County Durham and Paul’s parents from Birmingham, and relatives came from as far as Berkshire and Somerset to the Scottish Borders for the occasion. 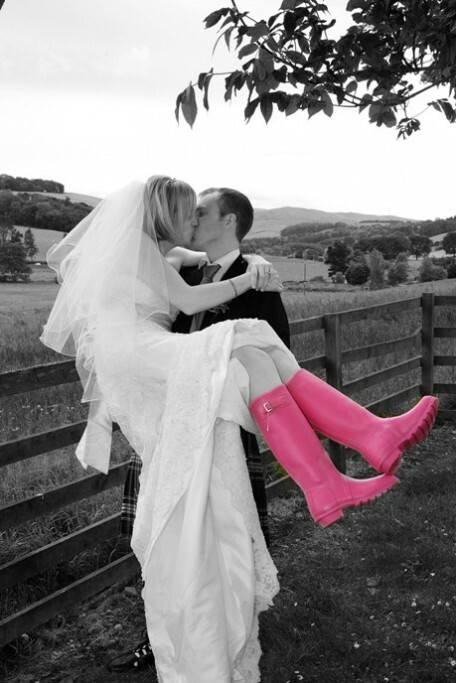 The couple met through work at NG Bailey and Paul proposed on the romantic Isle of Mull off the west coast of Scotland in May 2009. 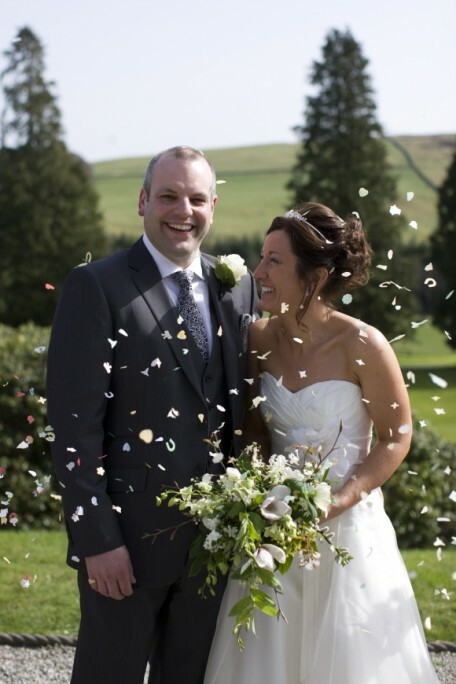 Alison was very clear about the sort of look she wanted for her wedding, opting for a wonderful natural bouquet, including lily of the valley, magnolia buds, jasmine, dendrobium orchids, hellebores, beech twigs and a twine handle. 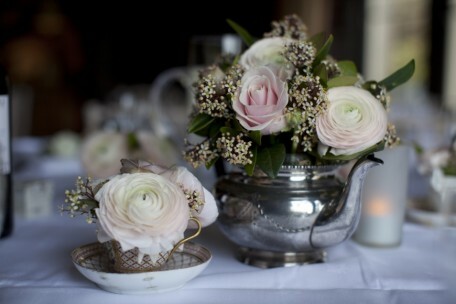 For her table decorations, we used vintage coloured roses, pale pink ranunculus and skimmia in silver teapots, with 19th century hand-painted cups and saucers surrounding each teapot. 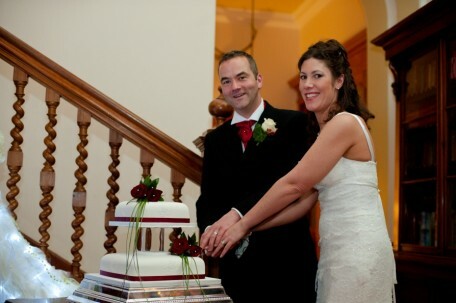 Her dress was a Sassi Holford design found at The Bridal Gallery Finedon in Northamptonshire. 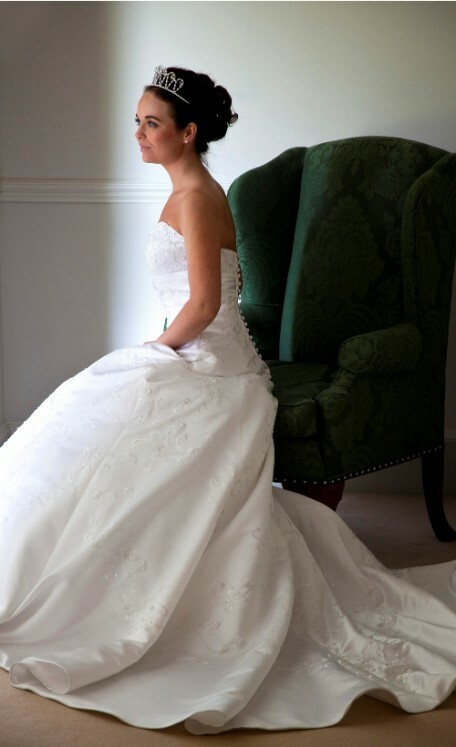 Sassi Holford also designed the dress worn by Autumn Kelly, Princess Ann’s daughter-in-law, at her wedding in May 2008. Meldon Catering provided sandwiches and cake for lunch, and then a delicious meal including black pudding and grilled goat’s cheese with sweet chilli dressing, followed by fillet of beef or salmon, and French apple tart. 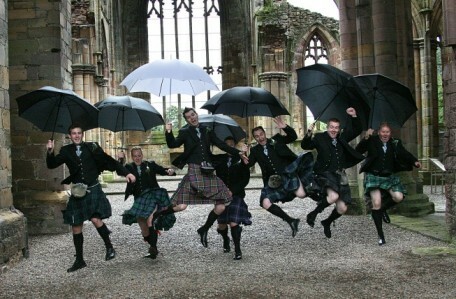 They were also up early on the Sunday to treat guests to a fabulous full Scottish breakfast. 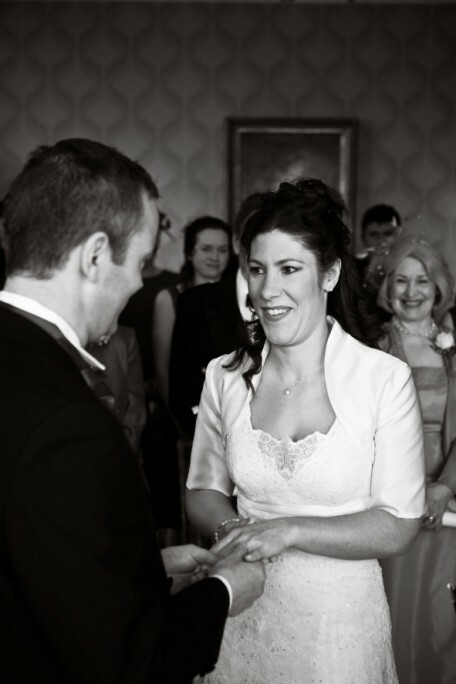 Dominic Ibbotson from Duke Studios in Edinburgh – a VOWS nominee 2010 – was photographer for the day. 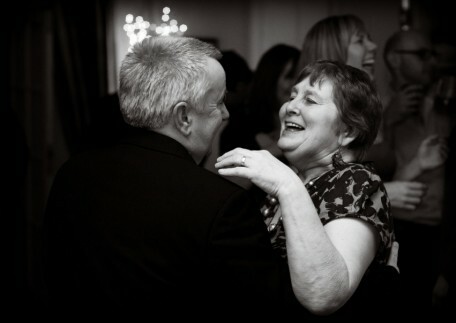 He has a great chatty, fun approach and always gets the best out of wedding guests. 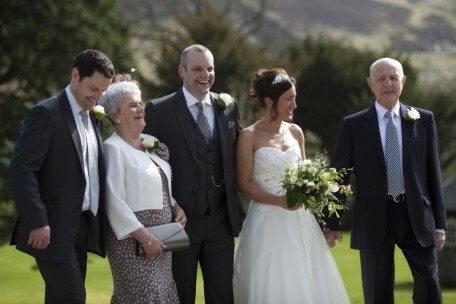 Paul and Alison were really thrilled to have their parents and close family relatives with them. Alison’s 91 year old grandmother, Margaret Howden, really enjoyed herself. 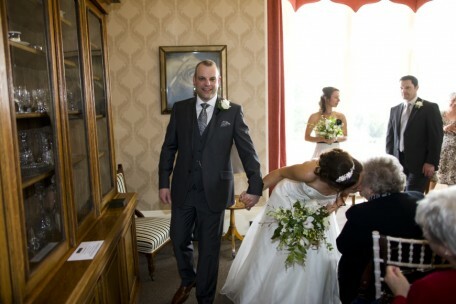 There was a special kiss for her as Alison and Paul walked out of the ceremony. Margaret was found contentedly crocheting the night away in the conservatory, while the younger guests danced around her during the evening! Paul’s brother, to whom he is very close, made a very moving speech and was a real support to Paul and guests. Unfortunately, Paul’s mum, Brenda, had a fall and broke her ankle in the gardens. The weather was beautiful and she was determined for the photographs to continue, so everyone gathered round her for some lovely group shots. Sadly she missed the meal, as an ambulance took her and her husband, Geoff, to Borders General Hospital. We wish her a speedy recovery. Alison’s mum, Ruth Howden , did a brilliant job with a lot of the organising, and there were beautiful bouquets to thank mums for all their support. 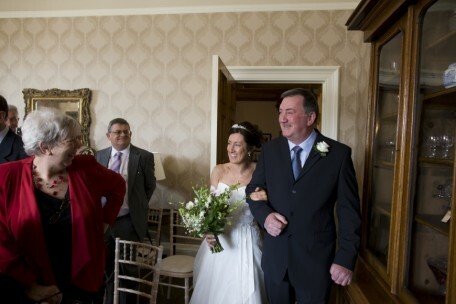 Arthur, Alison’s dad, looked so proud as they walked into the ceremony. 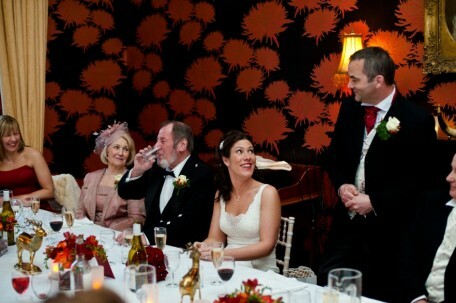 All the guests had a wonderful time, and everyone loved the fact they there was time to chat over the weekend. Alison and Paul have just returned from their honeymoon, which included Singapore, Malacca, Penang, Kuala Lumpur and Langkawi off the mainland coast of north western Malaysia. They flew via Quantas and were treated to two bottles of champagne on the way and another one on the way back. 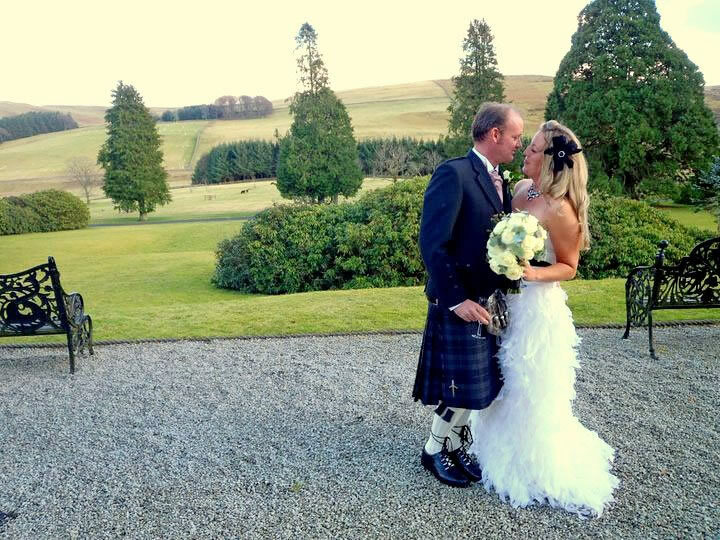 Hoscote House, one of our favourite our big house wedding venues in the Scottish Borders, was delighted to welcome Niccie and David from Cheshire for their winter wedding celebrations in early February. Niccie looked fantastic in a stunning lace Cymbeline dress from Paris which she found at The Wedding Shop in Alderley Edge, and her hair and make up were created by Katherine Milby. Get Knotted created the flowers with a vibrant red colour theme. 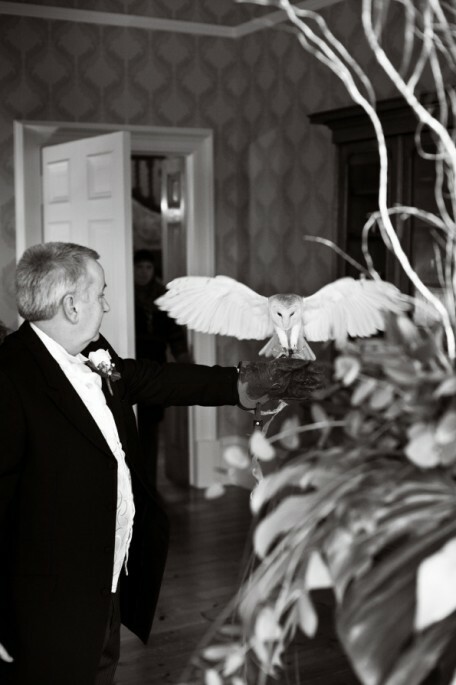 Julie from Falconry Scotland brought along the beautiful Bonnie the barn owl, who silently swooped in to deliver the wedding rings – always a wonderful moment. And there was a dusting of snow outside on the hills in the beautiful Roberton Valley, just as the clients had wished for (and all part of the service!!!). 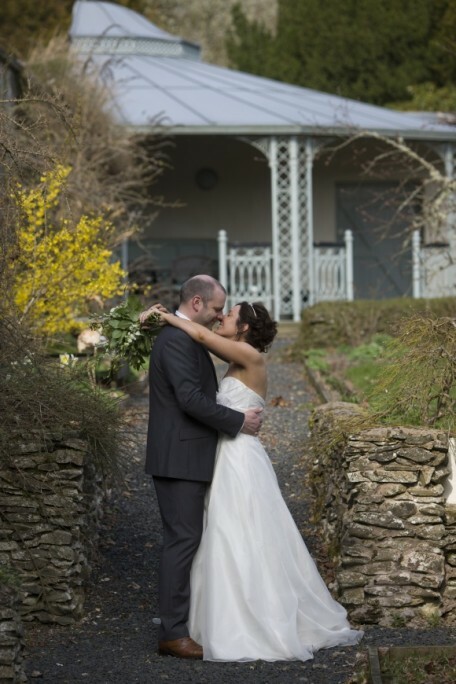 We wish David and Niccie every happiness and a wonderful honeymoon to New Zealand later in the year. With vintage weddings being such a big theme, here’s a lovely idea for vintage transport with a fun twist! This fabulous vintage ice cream Rolls Royce is a genuine piece of Scottish history which is bound to create a great talking point and provide some gorgeous romantic photos. This amazing vintage Rolls Royce was originally built for the Marques de San Miguel of Spain back in the 1920s. It was then owned by Viscount Scarsdale, and finally bought by S Luca, who lovingly converted it into this unique Rolls Royce ice cream van. It’s now available for hire for weddings and can be driven to venues within a 50 mile radius of East Lothian, including most of our our Get Knotted wedding venues in the Scottish Borders. 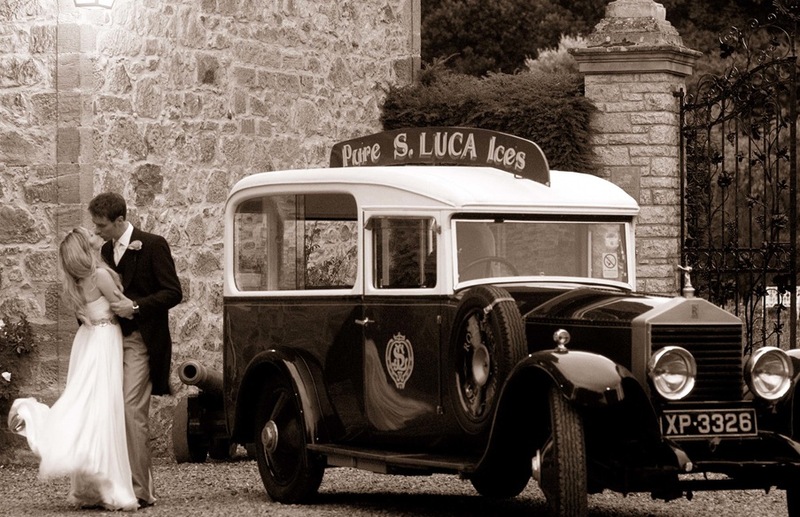 S Luca has been making fabulous ice cream for 100 years to a secret family recipe, and they’re based in Musselburgh and Edinburgh. They also do a great range of confectionery, including chocolates, truffles, and fantastic classic sugar mice, soor plooms and Hawick balls! Not to mention their famous Knickerbocker Glories, Banana Splits and Chocolate Nut Sundaes. Maybe an idea for your wedding dessert? 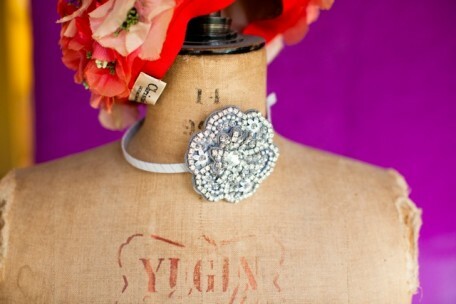 Click for more fun ideas for your vintage wedding. It’s been a busy time at Mellerstain recently – I’ve been seeing lots of new couples who are looking at this amazing venue with a view to booking their weddings. 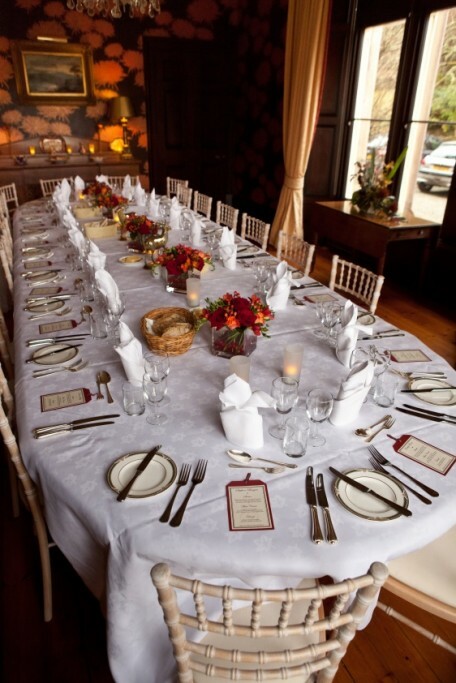 Mellerstain has just launched a very special package for up to 80 guests. 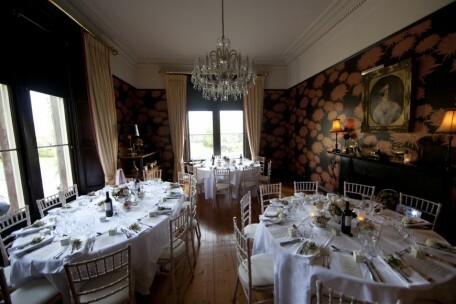 The package includes exclusive use of the house, catering, drink, flowers, photography and a night’s complimentary accommodation in one of the four-poster wedding suites. This one-stop shop means couples only have one bill to pay – keeping the process nice and simple and a great price too! 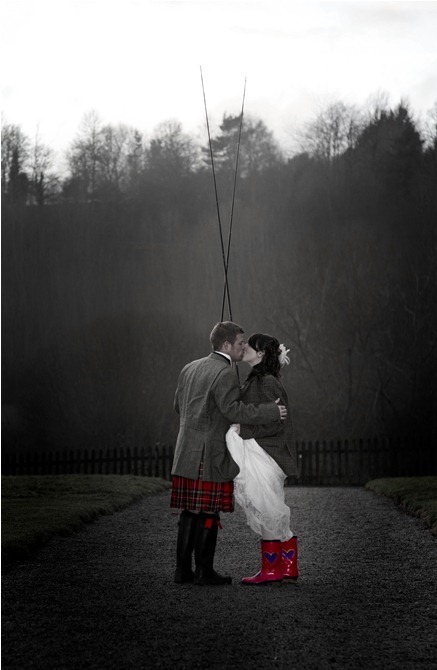 Visit the Mellerstain website wedding page for further details. I never tire of showing people around Mellerstain. There’s always something interesting going on and it’s quite incredible to imagine all the people that have passed over the threshold of this fairy-tale Robert Adam house. At this time of year the snowdrops are spectacular and Mellerstain has just celebrated it’s 5th year as part of Visit Scotland’s Scottish Snowdrop Festival. 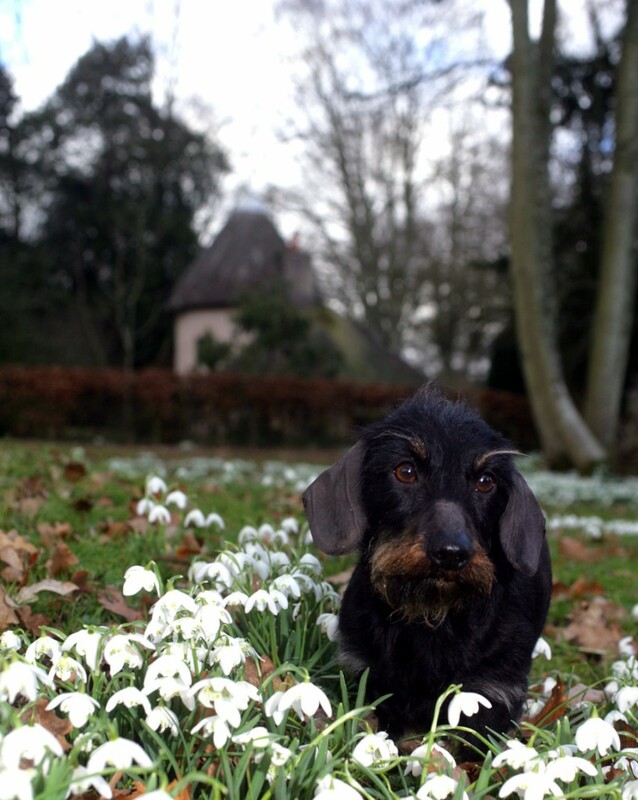 Here’s Mellerstain’s resident daschund, Gertie, enjoying the snowdrops in the grounds! 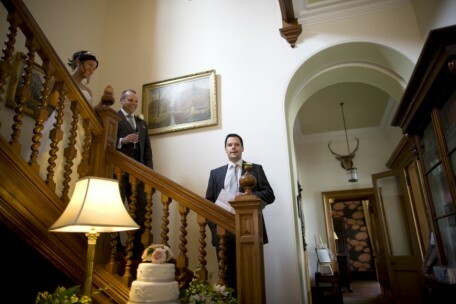 Hoscote House in the Scottish Borders welcomed Guests from as far as Texas and Wigan for the wedding of Liz and Gareth on 26th February. Liz and Gareth have busy lives working on board chartered yachts in warmer climes, and were looking for a chilled-out relaxed weekend with friends and family. Hoscote’s fabulous in-house caterer, Cathy Barker from Meldon Catering, supplied a Friday night supper for everyone and the following morning Gareth and the boys took off to Braidwood Sporting Clays while the girls enjoyed the whole process of getting ready in 5* luxury at Hoscote. 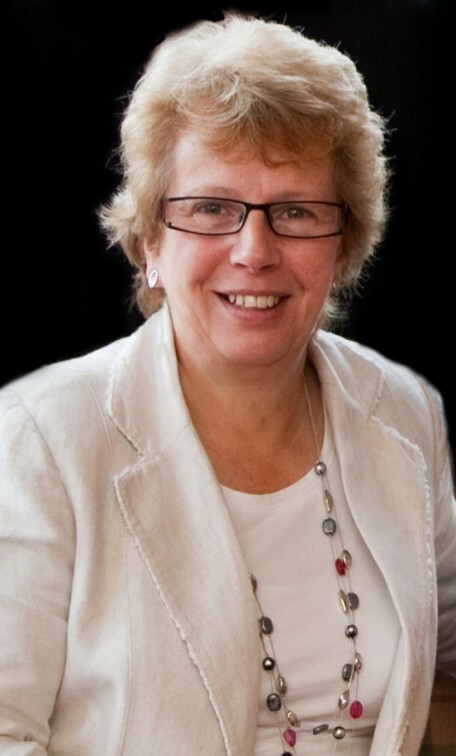 It was a particularly special ceremony as we said farewell to Mona Hope, our lovely registrar in Hawick who is off to enjoy a well earned retirement. Liz looked amazing in an incredible dress by Tadashi Shoji with a feather skirt, which she bought from Bloomingdales in the States. Head chef Tony was busy all day preparing a slow cooked Borders beef dish and fantastic smells eminated from Hoscote’s kitchen! After dinner, Stuart Anderson’s fantastic ceilidh band had everyone dancing till late. 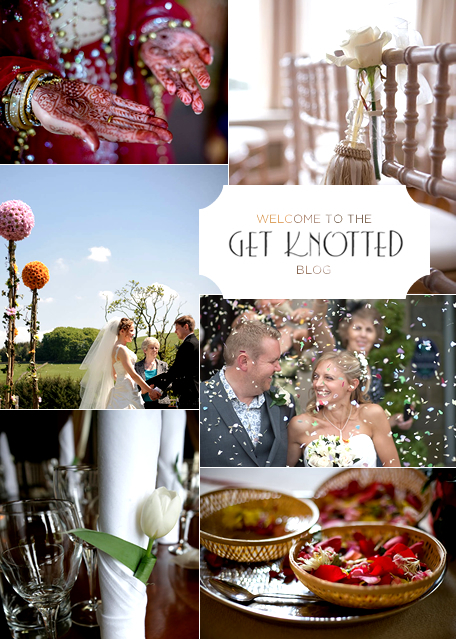 Welcome to the Get Knotted website which went live only a few weeks ago. 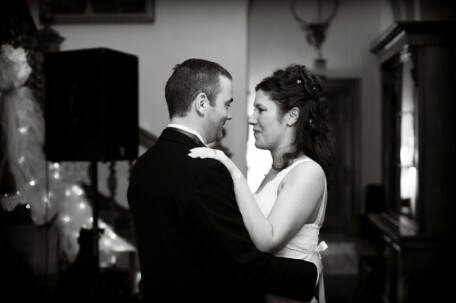 A big ‘thank you’ to all those who helped us, including IfLooksCouldKill and Texthouse, our couples and photographers. 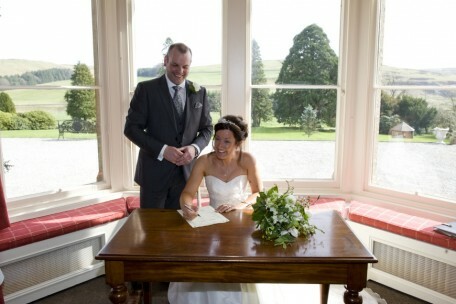 Get Knotted is a friendly and practical wedding planning agency based in the Scottish Borders. 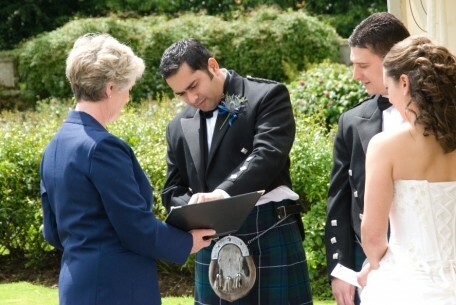 We’re all about helping you find your perfect venue and enjoy a wonderful wedding for you in the stunning Scottish Borders. 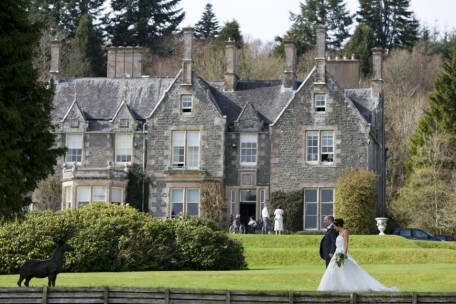 We work closely with three fantastic venues: Hoscote Estate, Mellerstain House, and The Buccleuch Arms Hotel. 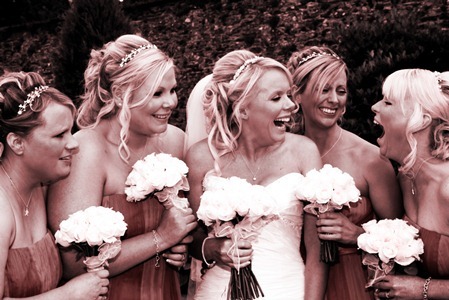 We also offer a freelance wedding planning service, from help with arranging a marquee wedding in a field at home or just a few hours guidance to help you get organised and find the right wedding suppliers. We’re keen to help you with creative ideas too – from fresh flowers, to vintage brooch bouquets, to props for hire and simple decorative ideas to give your venue a little extra sparkle. We’re going to blogging on a regular basis, so do stay in touch!